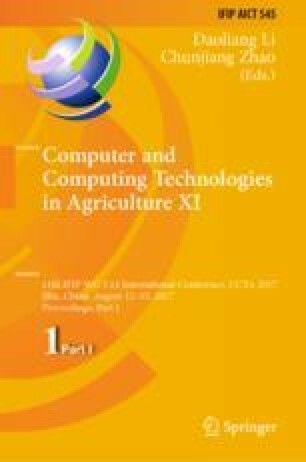 In this paper, an automatic segmentation and counting method for insect monitoring in orchard was proposed. The method based on image processing consisted of: (1) touching insect detection, (2) local segmentation points search using boundary tracking and morphological thinning operation, recursively, (3) segmentation lines implementation using the shortest distance idea. Algorithm performance was evaluated in terms of segmentation ratio and segmentation accuracy. Compared with the watershed method, the proposed method had improvement in evaluation criteria. Its average segmentation ratio was 1.03 and average segmentation accuracy was 96.7%, respectively. The results demonstrate the proposed method is an alternative solution for insect monitoring in integrated pest management. This research was supported by Beijing Natural Science Foundation (6164034) and National Natural Science Foundation of China (61601034). All of the mentioned support and assistance are gratefully acknowledged.